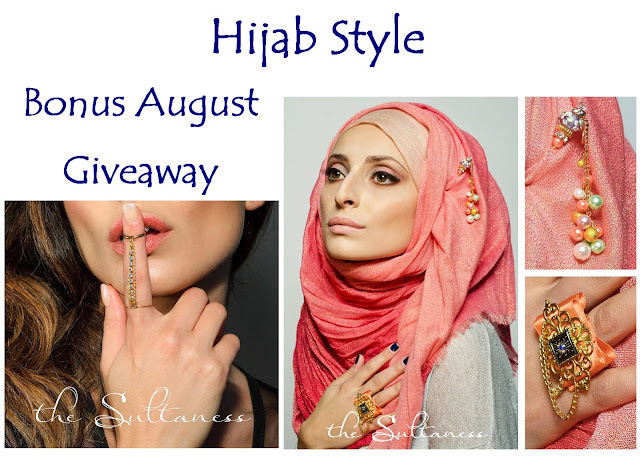 For the second giveaway this month, Hijab Style is giving you the chance to win accessories including the Aurora True Connection Ring, Pastel Punch Hijab/Scarf Pin and the Gulistan Ring (your choice of colour) from The Sultaness! 1. Follow The Sultaness on one of the following: Facebook, Pinterest, Twitter, or Instagram. 3. The Sultaness say: Our company has a set of Immutable Laws we live by. One of our Immutable Laws is Be the Dream. Be the Dream Everything starts with a dream, and ends with sustained effort and action. Our dream is to be the number one Muslim-owned brand for handmade luxury in the United States and serve as an inspiration for those around us. Answer the following question: What is your dream/passion? Why and what are they doing to achieve it? Send an email in with your answer, full name and city with 'Bonus August Giveaway' in the subject line to hijabstyle@hotmail.co.uk. The deadline for entries is midnight GMT on Saturday 24th August 2013. The best answer will be chosen and the winner contacted via e-mail. Don't forget to tell all your friends and family too - the giveaway is open to entrants from all countries! My dream, one amongst many is to succeed in my newly re-launched clothing brand Sorayya. I will not give up and will push my way through Inshallah! It has been my passion since I can remember and passion is the biggest factor in whatever field you choose in life! My dream is to write a novel (or many! ), and also to photograph and write for a magazine! At the moment I write short stories, blog, doodle, draw and just about write all over the place to get inspiration - inshallah, I'll get there soon!